If you are in Salzburg as a tourist, you probably won′t be interested in any of the city′s sports facilities – unless you go there for a specific sport event, in which case you will already know where to go. This article is meant to be a guide for people who stay in Salzburg for several weeks or extended periods of time and want to either watch sport competitions or do sports themselves. Sportzentrum Rif: You are English-speaking and looking for opportunities to do sports whilst being in Salzburg for several months? In that case, chances are high that you are a student on some kind of exchange program. Lucky you! The University of Salzburg has a sports centre in Rif, south of the city centre. The facility is easy to reach via the public city busses and rates for students are less than affordable. There are rock climbing walls, swimming pools, gyms and other things. Salzburg Stadium / Red Bull Arena: The so-called Red Bull Arena is the official soccer (aka football) stadium of Salzburg. Thanks to the European Championship of 2008, the stadium was extended and now seats more than 30,000 people. The local football club Red Bull Salzburg is sponsored by a locally made energy drink. 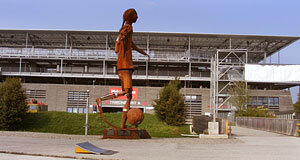 The stadium can be found between the Europark Shopping Mall and Schloss Klessheim. Eisarena Salzburg: The Eisarena ("Ice Arena") is another target (victim?) of Red Bull sponsoring and home of the locally very popular ice hockey club. The ice rink in the centrally located Volksgarten was built in the 1960ies and thoroughly modernised in 2002. In fact, there are two ice rinks, each 30 by 60 metres. One is covered by a roof and incorporated into the arena, the other is more commonly used by private skaters. Gear can be rented at the site. Sporthalle Alpenstraße: This hall is a multi-functional facility. Concerts and other events with large audiences are held here; however, the Sporthalle Alpenstraße is primarily a sports venue. Football, tennis, basketball, volleyball and other games are played here, usually by local sport clubs who rent the hall. It is fairly centrally located, south of the city centre. Swimming and public lidos: There are more than a dozen of lakes and several hot springs with spas more or less at the doorstep of Salzburg – therefore, the city has relatively few public lidos for a community with some 150,000 residents. Note the Paracelsus Hallenbad (indoor pools in German are called "Hallenbad") just behind Schloss Mirabell; the Freibad (public lido) Leopoldskron, often called "Lepi"; the Freibad Volksgarten; and the Freibad Alpenstraße – all of these venues are very central. Note also the Badesee Liefering, a small, artificial lake. There are plenty of opportunities to do sports in and around Salzburg. Water sports, skiing, hiking, paragliding – when it comes to sports and outdoor activities in general, it is hard to beat Salzburg. The addresses given in this article are a mere introduction and should aim only at first contact points. From there, you will immediately find plenty of opportunities to explore the sportive side of Salzburg yourself.